Why do you condemn the celebration of the what Christians think is birth of the son of God (Allah)? We should be teaching respect for other peoples and religions. Yet with such condemnation and calling it falsehood, it makes it difficult for rational, honest, and respectful persons to communicate. Praise be to the One God, who begets not, nor is begotten. You seem to have misinterpreted the condemnation of celebration of Christmas as a matter of disrespect for Christians. In reality, it is out of respect for Allah and Jesus and the teachings of our Prophet Muhammad, peace be upon them. It is an integral part of our faith to reject celebrations that have not been prescribed and/or that have a basis in falsehood, as inevitably they lead to misguidance and alterations in faith, as has happened with Christianity. There is nothing "radical" or "fringe" about this. It is our basic right to protect our faith and practice from distortion and falsehood. Surely no one has a right to condemn us for this. 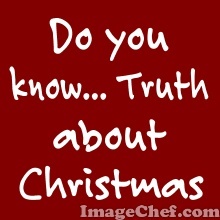 So as any rational person can see, there is no sound basis for Christmas, nor did Jesus (peace be upon him) or his true followers celebrate Christmas or ask anyone to celebrate Christmas, nor was there any record of anyone calling themselves Christians celebrating Christmas until several hundred years after Jesus. So were the companions of Jesus more righteously guided in not celebrating Christmas or are the people of today? So if you want to respect Jesus, peace be upon him, as Muslims do, don't celebrate some fabricated event that was chosen to coincide with pagan festivals and copy pagan customs. Do you honestly think God, or even Jesus himself, would approve or condemn such a thing? If you say approve, then obviously you are not interested in the truth. We ask Allaah, the One, Singular God, with no partners or sons, the God of all creation and mankind, to guide us all to the path of guidance and sincerity.